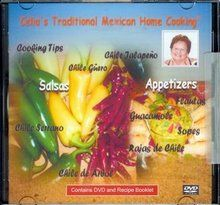 Celia's Traditional Mexican Home Cooking Recipe Booklet for Salsas and Appetizer comes with instructional DVD. Prepare delicious Authentic Mexican Salsas from mild to extra spicy using chiles gueros, chile de arbol, chiles jalapenos and chile serrano. The Mexican Recipe Booklet and DVD provides step by step narrated photo instructions. the booklet is 4 3/4" 4 3/4" to easily fit in your recipe box. For over 50 years, Celia Armendariz has prepared meals for her family of 7 children and 11 grandchildren. Celia has perfected traditional Mexican recipes rooted in her home state of Durango, Mexico, updating them with affordable ingredients readily available in local food markets while retaining authentic Mexican textures and flavors. Now her daughter Anna is preserving those recipes for future generations and lovers of quality home-cooked Mexican dishes. Buen Provecho! For more Mexican cooking dvd's from Celia Armendariz you can contact Anna by writing to joyan@vbatech.com.